The N842-05M-12-MF MTP/MPO Multimode Patch Cable is a 5-meter patch cable that supports 40 Gb Ethernet speeds and is designed for high-density connections between network equipment in telecommunication rooms and data centers. 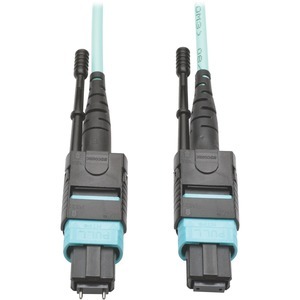 With one male and one female MTP/MPO connector, this OM3-rated multimode fiber optic cable allows IT professionals to extend the length of their connection and eliminates the need for long fan-out cables or individual long duplex cable runs. MTP / MPO Extension cables used with Tripp Lite High Density patching systems, in particular MTP/MPO Feed-Through Cassettes, such as Tripp Lite N484-12M12. 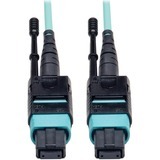 The 12-fiber MTP/MPO connectors are about the same size as SC connectors, but are 12 times denser, freeing up circuit card and rack space for other cables. The cable has documented insertion loss and back reflection testing on every connector and attenuation loss that meets or exceeds current standards. Push/pull tab connectors are easily accessible in high-density data center applications and make the cable easy to install and remove with one hand. Backward compatible with existing 50/125 fiber, the aqua-colored N842-05M-12-MF has 50/125 duplex(zipcord) fiber made from glass, as well as a plenum-rated jacket for connecting high-speed network components in ceilings, walls and ducts. The laser-optimized multimode fiber(LOMMF) cable meets the most current industry standards, including IEEE 802.3ae and TIA LOMMF.